I have used every other toning shampoo on the market. This is the best. I just dampen hair, (its thick) and pour this on. Lather it up and use shower hat. You may find that you need to just mix a little normal shampoo if your hair is finer. I leave it on for 15 mins. Just experiment. Very heavily pigmented. Use gloves. I do this once a week, but you may find its too much. Start off using as shampoo and see how the result is. Fantastic product and price. There is only one other purple shampoo in the world that is worth talking about and that's Silver Reflex by Keune - legit every other one is useless in comparison. This p/shampoo is the strongest one so you can mix with your normal shampoo for a less intense toning. Love the smell, makes me hair so soft and gives beautiful tones to lightened hair. Wouldn't leave on longer than 5 minutes as super light hair WILL go purple. Never found it cheaper anywhere else! I love this product and the service and fast delivery was amazing. It is cheaper then going to the shops and buying them and it comes with a couple of samples to trial. I will definitely purchase this again for sure. Best purple shampoo ive ever used. Better then salon products I reckon!! I was very unhappy with my brassy coloured locks after my last visit to my hairdresser when i stumbled upon this product. I'm so glad i found it as it has turned my brassy coloured hair back to a lovely ash colour. I use it twice a week and i find that it is not as drying as other purple shampoos. I leave it in for the full 5 minutes it states on the bottle. I then follow with the conditioner from this range to make sure it has completely washed out. It does stain your hands though so i would recommend using gloves. Best blonde shampoo I've tried! Got rid of all yellow tones from my hair, doesn't dry it out either. Definitely a staple in the bathroom. Wonderful product, just NOT for fine hair! 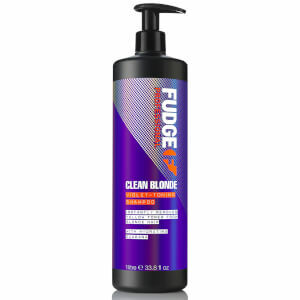 I purchased 4 of the Fudge Clean Blonde Violet Toning Shampoo. The best shampoo for blonds at an affordable price. Free shipping and samples are an added bonus for shopping at RY.